There are moments when I simply cannot believe that I actually live in a major city. For example, I was walking in Warrendale over the weekend and came across a rooster that was walking along the street. 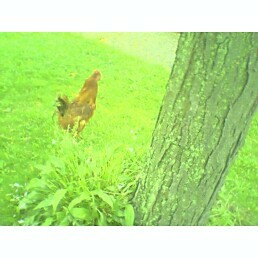 (Yeah, I know - it's hard to make out on the crappy picture from my camera phone but trust me, it really was a rooster.) I simply couldn't believe it. Where the heck did you see this? I've seen some things in the neighborhood, but yikes! Are we going to have to start calling it Warrendaletucky? It was on Piedmont, if I recall correctly. But I wouldn't start calling the place Warrendaletucky just yet. It was only that one time.